DIET: Feeds mostly on birds, rodents, frogs and lizards. Eastern green mambas are the smalles of the mambas. 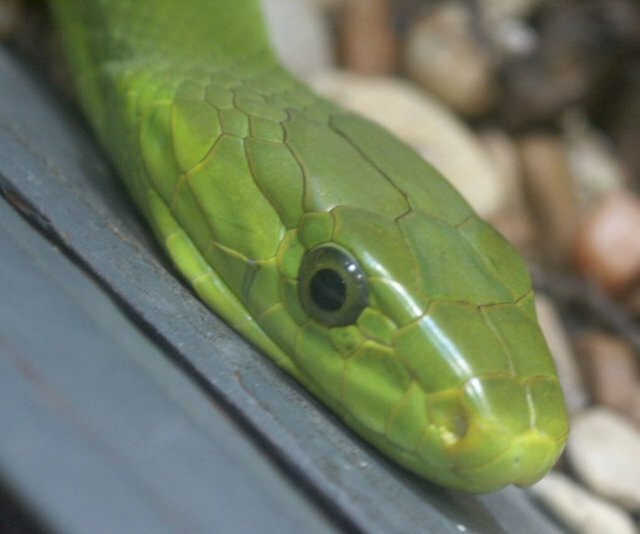 Green mambas reach an average of length of 1.8 meters, with a maximum length of up to 3.7 meters. The body is slender and bright green, with scales laid like paving stones against darker skin. The dorsal scales are darker than the scales on the belly. These beautiful fast-moving snakes are highly venomous, but less aggressive than black mambas. Mambas are elapids, with short front fangs and the venom is primarily neurotoxic. Digestion of prey is also aided by the venom. Green mambas are arboreal and hunt during the day for birds, frogs, lizards, rodents or other small mammals. They will hunt on the ground if suitable prey cannot be found in the trees. When disturbed or threatened, mambas prefer to flee, moving at speeds up to 7 mph, but will strike when cornered. Mambas can live up to 14 years in captivity. Mambas are solitary, except during mating. Males find females by following a scent trail. Male green mambas will compete with other males with a ritual dance or wrestling contest on the ground, in which one male tries to force the other down. These combats may last for several hours. Courtship and mating take place in the trees, after which the female lays 10-15 eggs. After a little over three months, the young mambas hatch and are about half a meter long. Encarta Concise Encyclopedia Article. Microsoft Corporation, 1998.